Prestige Stairlifts is dedicated to training its staff to the highest standard. This week our staff underwent thorough manufacturer training at Acorn Stairlifts head office. On display in their reception area proudly shows two of their most popular curved and straight stairlift. The course was presented by Acorn’s own very experienced in house trainers who know their products inside out. This knowledge and experience is passed on throughout the training and the course concludes with a final exam. We are pleased to say that our staff passed with flying colours. 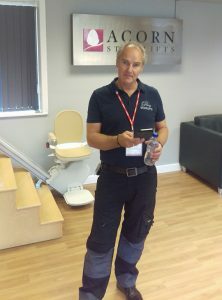 The training covered all aspects of stairlift knowledge from surveying, products, installation and servicing. Each engineer is presented with a certificate – one of which is now hung on the wall. Prestige Stairlifts are committed to give customers the highest standard possible. Investing in staff development and regular professional training ensures our engineers grow their knowledge base and remain current with stairlift production and customer service delivery.